Are you getting a “Parse Error – There is a problem parsing this package” message when trying to side-load an APK file to your Kindle Fire tablet? The issue can be caused by a number of different problems but the underlying issue is one of two things, either the file downloaded was corrupted or the APK file is not compatible with the Android version of your device. The other common issue that causes the parsing error is that your Kindle Fire OS is outdated and cannot support the app. 1. Go to https://play.google.com/ and search for the app you are trying to install. 2. 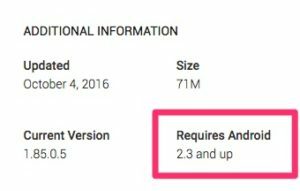 Scroll down to the Additional Information section and see which Android version is required to run the application.